HeartFest 2012 Poster. Artwork provided by Carola Marashi. Poster design by Marcus Scott. 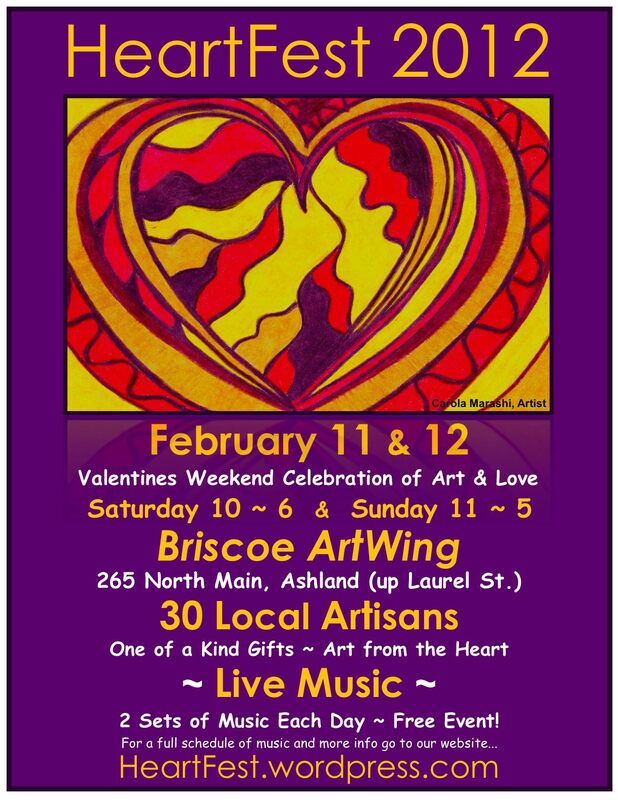 Lithia Artisans Market, in partnership with Briscoe ArtWing, announces the 6th annual HeartFest, a Valentines Art, Craft and Music event, February 11 and 12, Saturday 10:00 – 6:00 and Sunday 11:00 – 5:00. Thirty local artisans will gather at the Briscoe ArtWing, 265 North Main Street (up Laurel across from the Methodist Church), in Ashland, Oregon. Music from flamenco guitarist Martin Vee, songwriter Cole Cullen, and guitar and vocalist Jeff Kloetzel (click for a complete music schedule). If you are an artist or craft-person, and would like an application for this years event, please go to this link to download a copy of the application and read the instructions. APPLICATION FOR HEARTFEST 2012. I would like to personally thank artist Carola Marashi for her art duplicated on this years poster and postcards. This image just makes me happy. Carola will be the featured artist in the February edition of Locals Guide, so stay tuned for more about that. She will also be showing her art at HeartFest 2012. She has only been back in Ashland since the summer, coming to us via Austin. Please come by and welcome this new artist into our midst. This years event is loaded with talent, especially in the category of jewelry. An incredible array of diversity awaits the patron, you will surely find that special gift for a loved one on Valentines day. This is a time to embrace our loved ones and follow the lead of mother nature. I recently spent a weekend on the southern Oregon coast with my beloved. I was thinking about hearts, and the upcoming HeartFest at the ArtWing… everywhere I turned there were hearts… in the stones, in the sand, in a distant hillside. Once I saw them, they were undeniable. A January day on the Oregon coast as beautiful as they come, topped off by a picture perfect sunset. I don’t know what it is about this time of year, but I see the images so clear… maybe its because they are already on my mind. Or… maybe nature is sending a message. Love with all you have, love unconditionally, because love is all we got to get through. Hope to see you all at HeartFest February 11 and 12 to celebrate love in all its forms. Stay tuned for details about our HeartFest Heart-Art contest. It’s gonna be cool, or maybe hot… we shall see. HeartFe st 2011, February 12 & 13 at the Briscoe ArtWing, corner of North Main and Laurel, two blocks north of downtown Ashland, Oregon. The event is sponsored by the Lithia Artisans Market, and the Lithia Arts Guild. This is a great opportunity to find one-of-a-kind, handcrafted items that tell your loved ones you care enough to seek out unique, locally made gifts this Valentine’s Day. 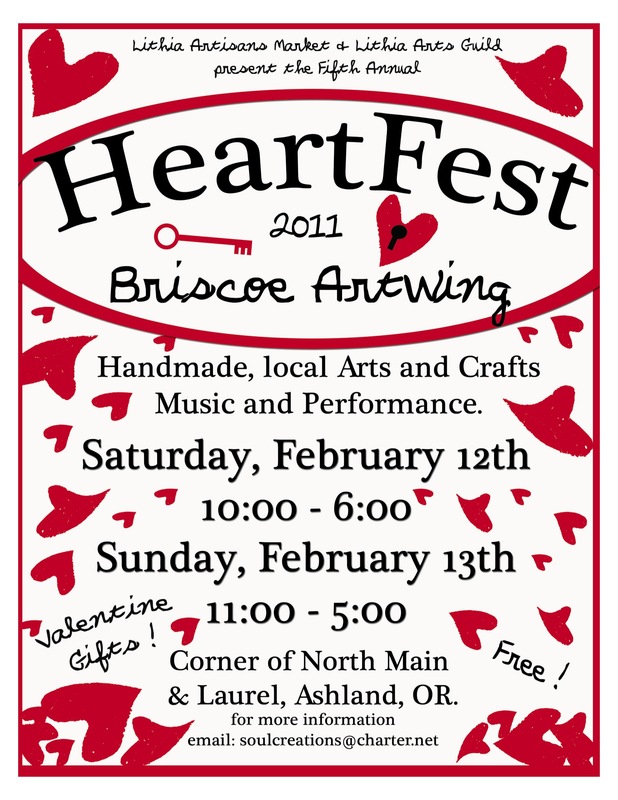 Over 20 artisans will gather at the Briscoe ArtWing to celebrate the fifth annual HeartFest. Jewelry, sculpture, metal work, fine art, clothing, wood work, and much more will be on display for the two day event. Live music will play throughout the weekend with such notables as Craig Wright and Joe Diehl, Marcella Ruikis and Jim Quinby, and classical guitarist Tim Church (see schedule for set times). Cookies and jams will be available from Pennington Farms. If you want something really unique and fun, check out the handcrafted hula-hoops. Featured artist at this years event, Pegi Smith, will be exhibiting her abstact, nature-inspired pieces. Adding to the theme, many of the vendors will be displaying their own depictions of heart symbols in cards, paintings, photography, metal sculpture, stone carvings, and more. This pre-Valentines Day weekend event takes place Saturday, February 12 from 10:00 a.m. ’til 6:00 p.m, and again Sunday, February 13 from 11:00 a.m. ’til 5:00 p.m., at the Briscoe ArtWing, corner of North Main and Laurel, across from the Methodist Church, on the north side of downtown Ashland — look for the banner and signs. The event is free to the public! Honor that special someone in your life by seeking out the perfect unique gift item at HeartFest 2011 — celebrating Art from the Heart. And remember, buy local, support your local artist, and keep our local economy strong.